A Supreme Court Bench comprising of Justice M.B. Lokur, Justice Kurian Joseph and Justice A.K. Sikri today issued a notice to the Central Vigilance Commission for assistance to ascertain whether ex-CBI Chief Ranjit Sinha’s meetings with the accused in the coal allocation scam had had any impact on the investigations and subsequent charge sheets or closure reports filed by the CBI. The court asked the CVC to file response by July 6. With regard to access of confidential CBI filed and documents by a whistleblower, the Court observed that if somebody accesses documents that ought to be carefully maintained by the CBI, it is difficult to find fault with such a whistle blower particularly when his or her action is in public interest. “It is another matter if the whistle blower uses the documents for a purpose that is outrageous or that may damage the public interest. In that event, it would be permissible for this Court or an appropriate Court to take action against the whistle blower, if he or she is identified. However, the present case is not of any such category,” it added. 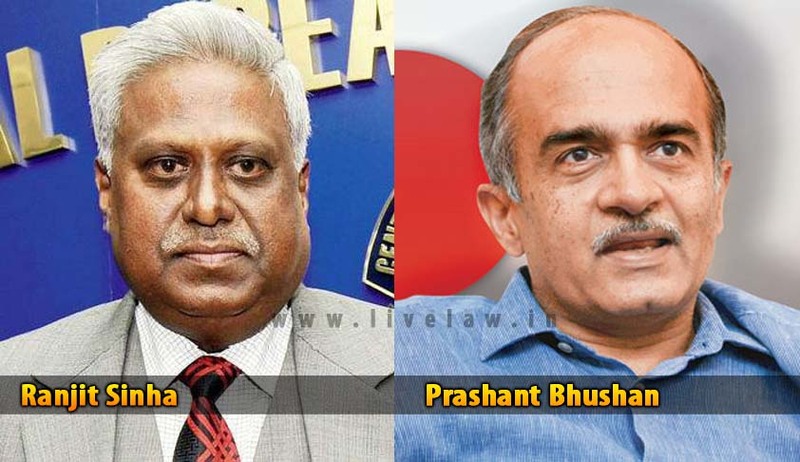 The Bench noted that since Mr. Ranjit Sinha had already superannuated, the question of his recusal from investigations and prosecutions being carried out by the CBI had become infructuous. An application was filed stating that Common Cause has come to know that Mr. Ranjit Sinha, had met several persons at his residence who are accused in prominent cases including the Coal Block Allocation scam without any of the investigating officers being present. The application stressed at the fact that Mr. Sinha did not meet them at his office or in the presence of the investigating officers. Rather, he met them at his residence without the investigation team being present. The entry register was submitted to the Court in a sealed cover. The Petitioners also made a reference to Mr. Sinha meeting some accused persons in the 2G Spectrum case. You may read the livelaw coverage of such allegations, here. In his defence, Mr. Ranjit Singh had contended that Mr. Prashant Bhushan, Common Cause and Mr. Kamal Kant Jaswal of Common Cause have deliberately made misstatements and stated facts that are not true with a view to mislead this Court. In the subsequent averments filed, the Court found it “noteworthy” that Mr. Sinha did not deny that he met some accused persons in the Coal Block Allocation case without the investigating officer being present. On the contrary, it was argued on behalf of Mr. Ranjit Sinha that it was his job to meet the accused persons and to get their point of view before taking a final decision in the matter of their criminality. It is submitted that there is no wrongdoing if he as the Director of the CBI meets some accused persons so that if they are innocent, they should not unnecessarily and without proper justification be subjected to a criminal prosecution.